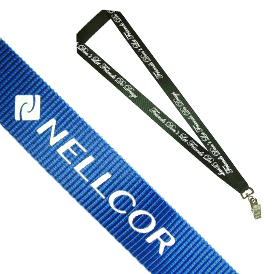 Woven silkscreen nylon lanyards are a great choice for an extra soft and durable lanyard. Nylon has a shinier appearance compared to polyester. Text and logos are silkscreened directly onto nylon. 1 color step & repeat imprint on 1 side of lanyard. Choice of standard attachment: bull dog clip, j-hook clip or split ring. Click here to view attachment options. Size: 17.5" on each side. Imprint size: Width minus 1/8". Additional color is available for an 0.18 (A) running charge and a 30.00 (G) set-up charge per color. 4 color maximum. When text is not printed continuously, but reversed at the neck, add a set-up charge of 30.00 (G) per color. For double sided printing add 0.18 (A) running charge per color, if the design is the same as the first side. 20 working days from artwork or sample approval for custom colors or other sizes. E R Ochsendorf Company One of our top suppliers. Dan & group have never failed to meet our deadline and expectations. Always helpful with product suggestions.